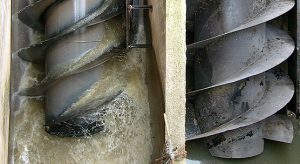 Filquip supplies WAM Archimedean Water Screw Pumps to the Oil and Water and Wastewater Treatment Sector. With over 1200 Screw Pump Installations worldwide at diameters up to 4m, The WAM PA-Type Water Screw Pumps have a refined design that delivers a quality system at economic price point. Since 1978 WAM Screw Pumps have been manufactured and installed around the world as a special type of volumetric pump. 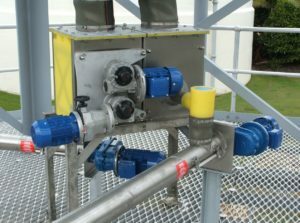 The PA Type Screw Pump has economic operating costs, flexibility and reliability allowing operators to vary the RPM of the Screw Pump without dramatically. These units can be installed into concrete channels or into fabricated steel troughs for adjustment to suit the location into which they are being installed. Available with outside diameters up to 4m. Available with flow rates up to 4,500 Litres per Second. Available in Single, Double or Triple Flight Configurations to suit all applications. Minimal maintenance requirements due to no cavitation wear and slow rotation speeds. The MBF range of Microbatch Volumetric Screw Feeders provide accurate volumetric feeding of powder and granular materials. The MBF Microbatch Screw Feeder for continuous volumetric feeding of powdery or granular materials consists of a Stainless Steel or Reinforced Polymer Body, a horizontally mounted rotating agitator tool, a feeder screw, a feeder pipe enclosing the protruding feeder screw and one geared motor drive unit each for agitator and feeder screw. WAM has tested product flow and material stress to establish optimum body geometry for feeding powders and granules, even those that tend to clog. 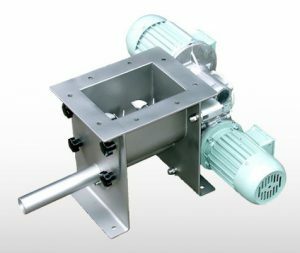 On request, MBF series Micro-Batch Feeders are supplied in food-grade versions with both FDA and EN- approval. Stainless steel body, Agitator tool and Feeder screw. Various agitator tool and feeder screw attachments to achieved desired flow rates. 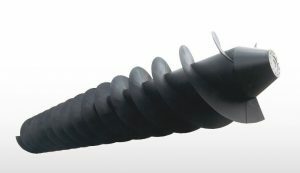 Available with Horizontal or Vertical spout outlets. Available with food-grade and Hazardous Zone Rated versions. Three standard body sizes, Throughputs of up to 6m³ / hr. Integration with a loss in weight system or VSD can provide automated accurate batching systems. Minimal clearance between screw flight and feeder pipe for high accuracy. Simple and quick cleaning due to non-stick SINT engineered polymer lining and quick access panel.